The firm of Math. 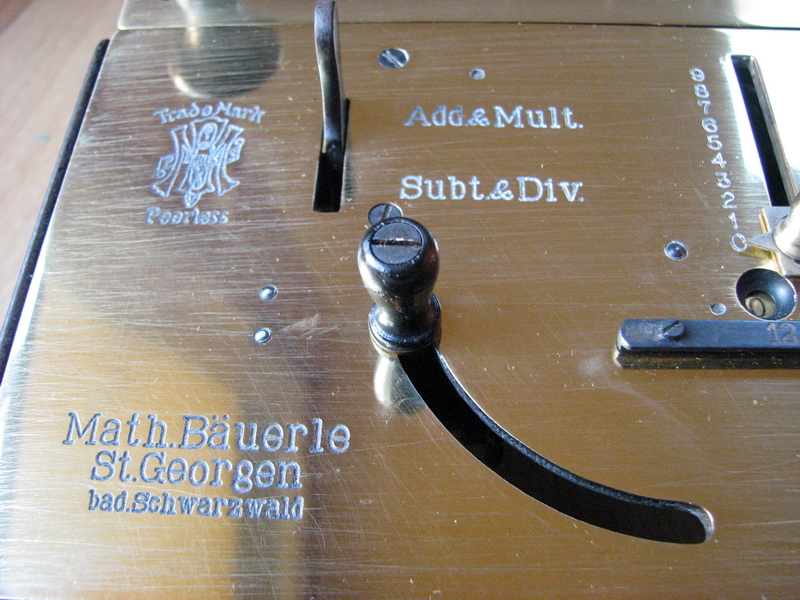 Bäuerle started building calculators in 1904. 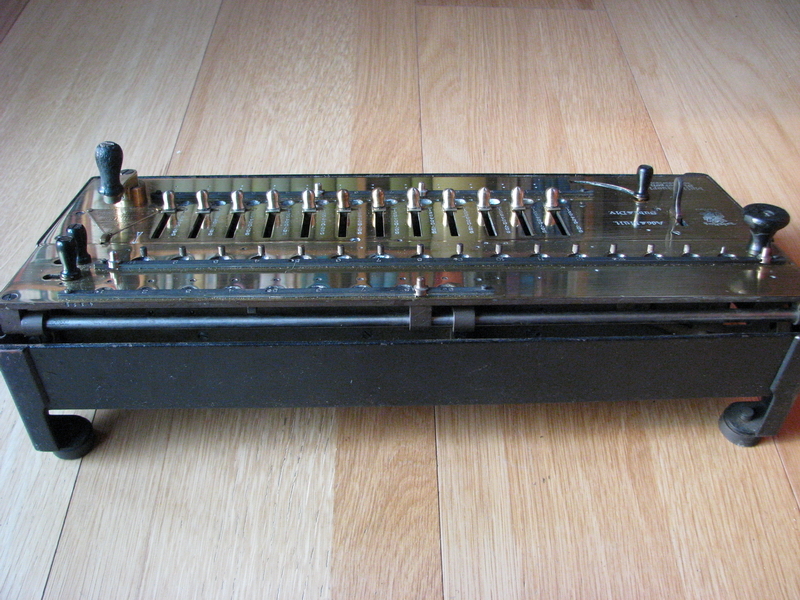 There were a number of styles, the third of which this machine is an example of. The first style was a horizontal machine in a wooden cabinet. The second style involved a machine with cast legs and the word "Peerless" cast into the metal of the frame, and finally this style of machine, which was much smaller than the previous ones. 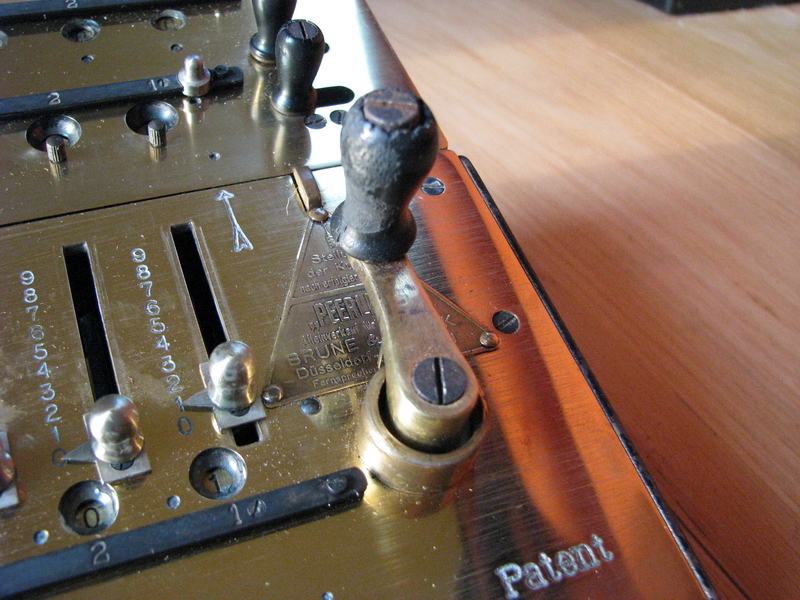 By this time (early 1920s) some of the machines sold had keys instead of sliders, and these were branded "Badenia". 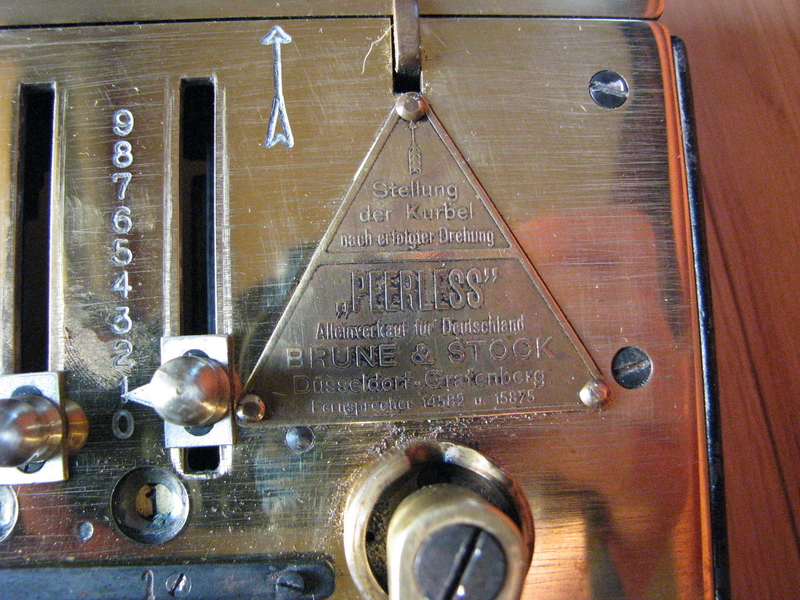 With the sliders, the machines remained "Peerless". 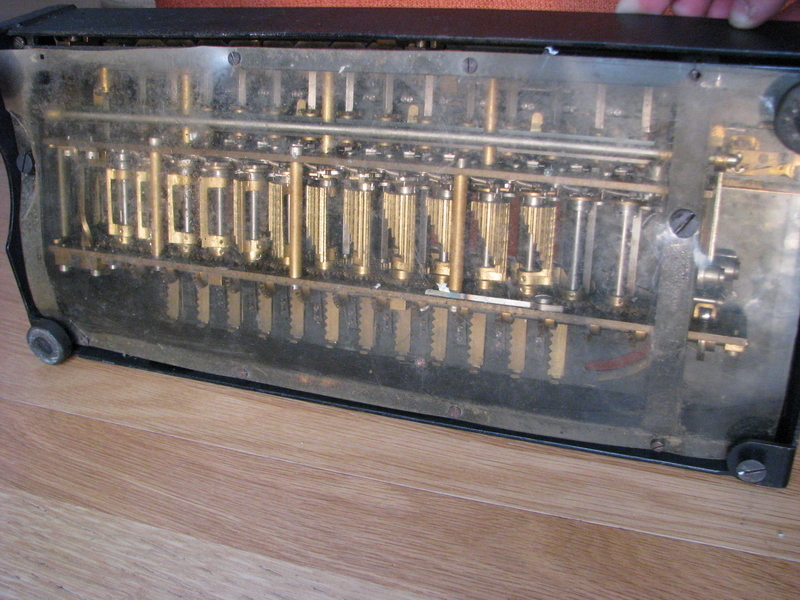 There was also a "Peerless Baby", in which the Leibniz cylinders were even a bit shorter from top to bottom than in this machine, making it even slightly more compact. The model designation IIa signifies 9 digits in the revolution counter, and 16 in the result register. 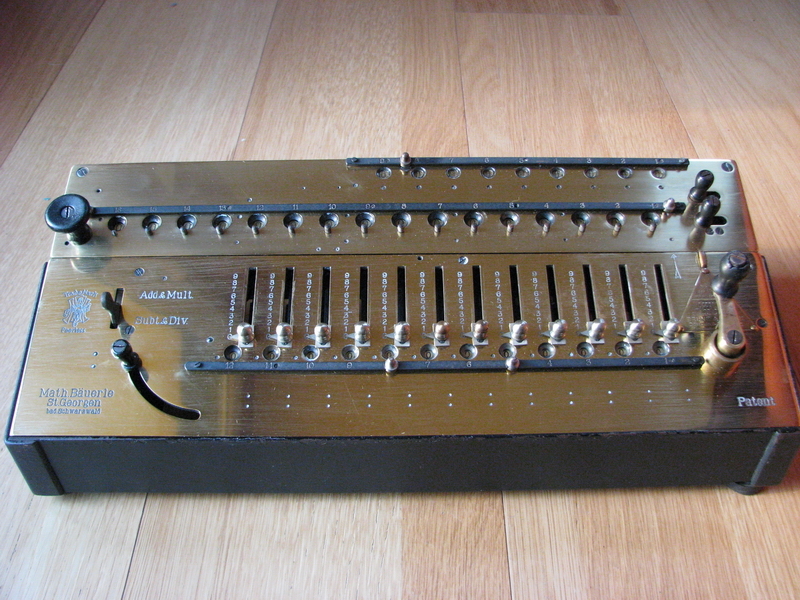 Model II had 9 setting sliders, model IIa 12. Martin gives a table in which all the models are listed. 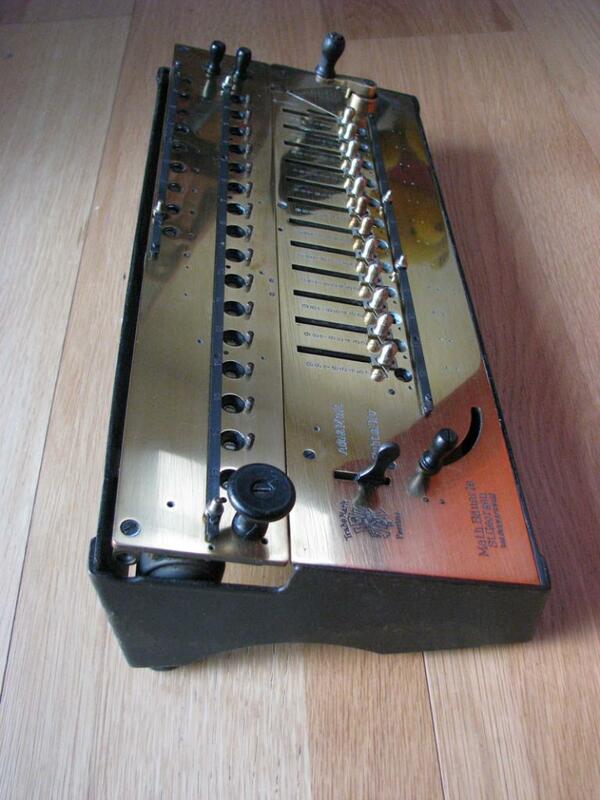 This particular machine I went to pick up in Düsseldorf, where it also came from originally. It was in the possession of an old man who was moving to a nursing home, and had asked to sell the machine for him. The seller did not know where he got it from. Clearly, however, a "restorer" had been at work before me. All the steel parts in the machine were quite rusty, as if it had spent time in a damp environment, maybe a basement. 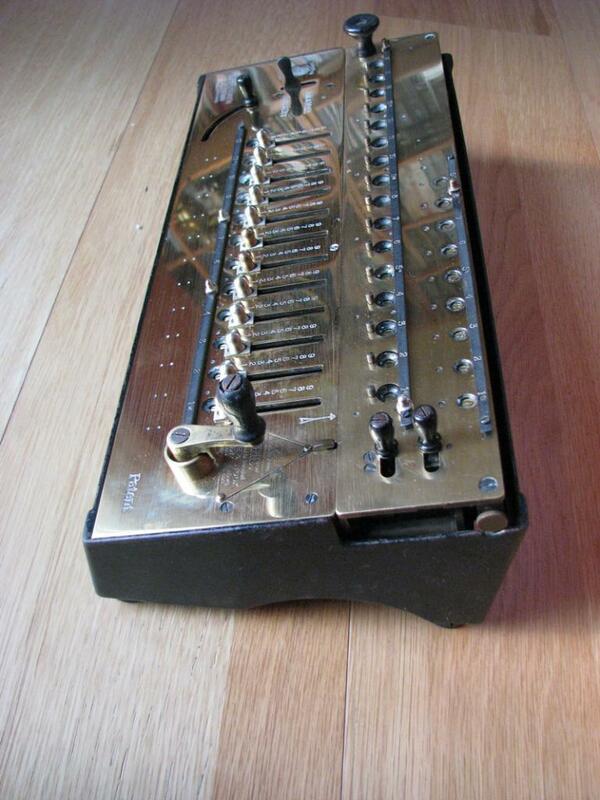 Most of the machine is brass however, and this survived well. The top plate had been badly polished and then varnished with the thickest layer of varnish I've ever seen on a calculator. The godawful stuff was everywhere, and insoluble in any of the solvents I tried too. I have not polished too aggressively, because I detest machines with a mirror finish on the metal where there originally wasn't one, so that means there still are left-to-right scratches on the top plate. I will leave the brass to tarnish naturally, because chemical means of inducing a nice bluing on brass are a little poisonous to my taste (potassium disulfide - "liver of sulfur" reportedly works well, but it is awful stuff). In twenty years or so, the machine will be pretty again - or I may reconsider my bluing policy. This was not the only problem the machine had - there were a couple more. 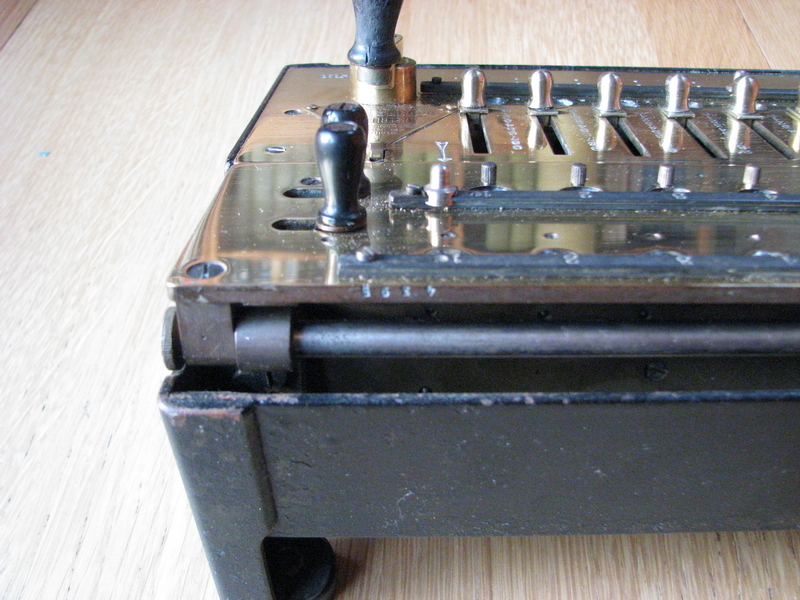 First of all, the bakelite handles deteriorated badly. 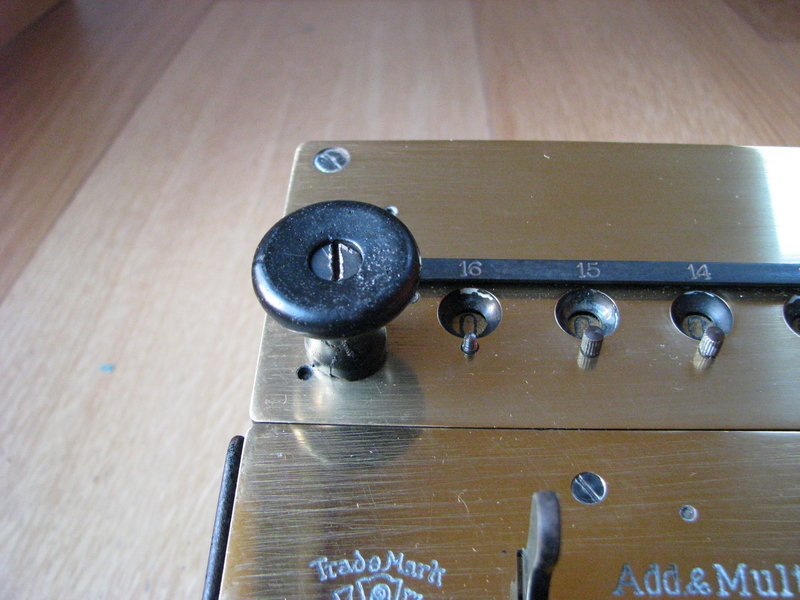 One was missing entirely on one of the clearing sliders, the knob for lifting the carriage had a big chip, and the main crank handle had rusted so badly that the volume of rust on the metal centre had cracked the handle from the inside out. The way to solve this is to judiciously glue everything back together, fill in the chips, holes and cracks with plasticine, make a silicone mold, and cast the parts new, in epoxy resin. This worked rather well. For a flawless result, I should use car body filler, sand them on the lathe and paint black, but for now I'm happy with the handles as they are. The second problem was more serious. The tens' carry didn't work reliably. It tended to hang up and block the machine on carrying from the third to 4th and 10th to 11th position. This boiled down to the mechnism for resetting the carry lever. It involves a pin with two flats ground on it, which both have to have the right angle with respect to the actuating lever. But the pin is crimped into the rest of the ten's carry lever, and if it gets loose, it rotates, the planes have the wrong angle for being acted on by the reset collar, and the mechanism doesn't function anymore. 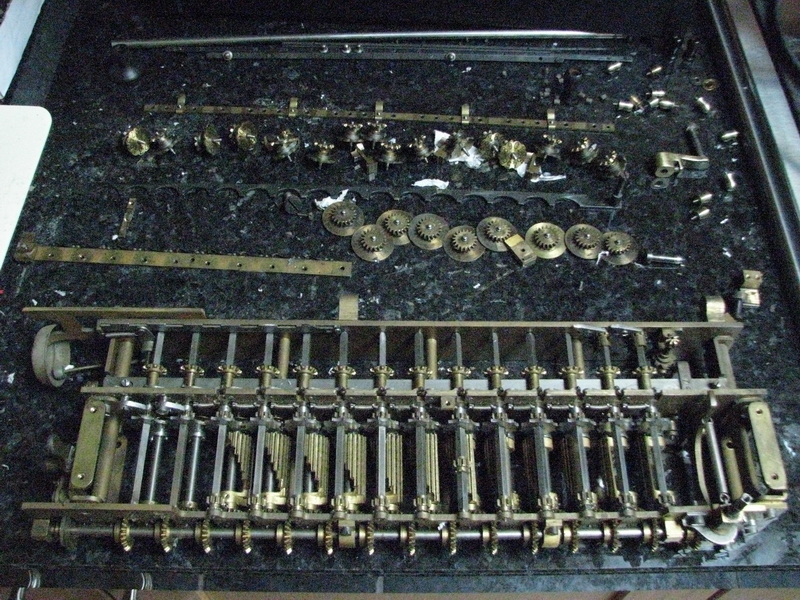 I have moved the offending tens carry levers to a position further up the carriage, so they have less chance to interfere with the proceedings, and have also turned the flats back to the correct position - the pins are not very loose, so they will stay ok for a while. Here are some pictures of this very beautiful large capacity machine. I can't wait until it tarnishes! Another very nice detail is that a celluloid plate was provided on the bottom - it would keep dust and dirt out, but would still offer a nearly unobstructed view of the mechanism. The machine was sold in Düsseldorf, but I don't believe that the seller's plate from Brune & Stock dates to the beginning of the 20s. It has phone numbers for Düsseldorf with 5 digits. Surely automatic telephone exchanges did not exist in the early, and even in the late 20s. This may at some point have been a refurbished trade-in machine that was resold, maybe even after being polished and varnished - although that rather seems like something that would have been done once it was a proper antique, in the 1970s or so.